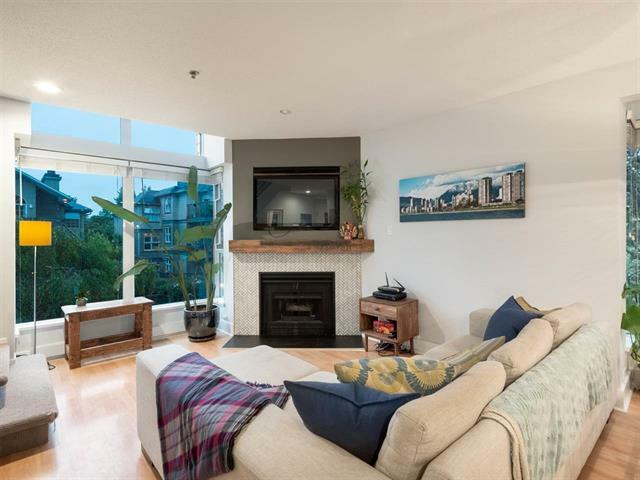 This bright and efficient 2bed/2bath townhouse end unit presents over 900 square feet of living space as well as 300+ sqft of outdoor space (including your own private roof top deck!) The abundance of windows on your main level provides plenty of natural light throughout your living/dining area where you can cozy up next to the gas fireplace. The tastefully updated kitchen space features plenty of cabinet storage, SS appliances and a wine fridge! The 2nd level offers two ample sized bedrooms both with its own balcony, the master with spa-like ensuite and access to the extra large roof top deck with sweeping views and plenty of space to entertain. To round it all out this amazing home comes with 2 parking and a storage locker and an extremely desirable location in the heart of Fairview.